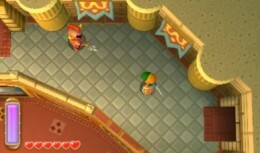 - Before assaulting the Castle, have a chat with Ravio in Link's House. He's now offering to sell you items. Like, permanently. No more of that dumb renting. The catch? Well... normal items cost 800 rupees, while Rods cost 1,200. Yiiiikes. Still, it's better than losing them whenever you die - and you get your first purchase at half price. (Seriously, I hate this guy.) I recommend buying a Rod, as it will save you more money overall, but it's up to you. Note that once you own items, you can also upgrade them at the Mother Maiamai by Lake Hylia - though only when you deliver ten of her babies to her. - Also, while you're here, check the rear of the house. There's a Maiamai latched onto the wall. - Meet Sahasrahla out front of the Castle. Heed his advice and strike the barrier in front of the gate with the sword. It will vanish and let you into the grounds. 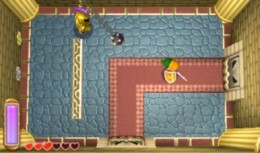 - Enter the west wing and you'll find a chest containing five rupees. What a discovery. - Enter the east wing and you'll find... well... nothing. So don't bother. - Climb through the parts of Hyrule Castle you've already visited, up to the ramparts, and enter that big door that was locked last time you visited. - Straight ahead and through one room you'll come to a new kind of soldier, one with a ball and chain. Wait for him to throw it at you, block, then sweep in and hit him. You can repeat until he's dead, but with each hit he's stunned long enough that you can keep up the pressure until he dies. - One room east is a corridor. Beat up enemies and follow the stairs. - Enemies in corridor. Beat 'em up to open the door. Simple. The last guy, up on the ledge, is a teensy bit tricky; you'll have to merge with the wall at the top of the stairs to reach him. - In the next corridor you'll face a series of living statues. Meh. You've done this before. - Balcony! Merge with the wall for health, if you want. Otherwise, continue west. - Cut scene! That dastardly Yuga. After he's fled, run up the stairs and wipe out the guards. They're toting some serious firepower, so you may want to use a Rod to quell their advances. Up the stairs! - Stairways guarded by bomb-throwers and normal guards. These bombs can be a real pain, so I suggest, again, using a Rod to knock them off balance. I like the Ice Roc, myself, but the choice is yours. - More or less the same deal here, only the guards on the sides now have bows... and they're firing two-at-a-time. Either ignore the guards on your walkway entirely and blow through with a dashing attack, or lure your guards to a spot where you're not under fire, OR use a Rod as appropriate. Your call. - A break room. Take the opportunity to steal hearts off of the walls, if necessary. Onward, to the final battle! Yep, rematch time. Yua is similar to his previous incarnation, though he works a new trick into this fight: duplication. 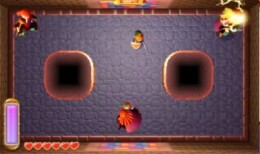 Throughout the battle Yuga will create two doppelgangers of himself which will sink into the walls and move around the room. When all three emerge they'll create painful lightning attacks, again telegraphed shortly before they go off. If you hit the wrong Yuga he'll turn into a soldier and attack you as normal. Fortunately, the real Yuga sports a tell: his staff is glowing with energy. Only attack this Yuga and you'll get in a few hits, usually before he can set off the lightning and disappear again. The more damage you do the stronger the soldiers become, but this is never a terribly difficult fight. Keep up the pressure and he'll give in soon enough. - Follow Yuga. You'll wind up in a study. Slash at the fluttering drapery in the room, then slip through the crack in the wall behind. You'll emerge... somewhere... quite different. - Leave the new study you're in and follow the path. Watch the cut scene. Yep, that's... that's bad. Well then. Welcome to Lorule...? I guess...? So much for the end of the game, eh?